It’s been a long time since I was last in full-time education. In 1997, I graduated from UMIST (now merged with the University of Manchester) with a BSc in Textile Design and Design Management, but still had a desire to learn more. I just wasn’t completely sure what it was I wanted to learn. Since then I have tried all sorts of things via evening classes, short courses and workshops to satisfy my desire for learning. I passed A-levels in Business Studies and Photography through studying in my spare time. I learnt how to design gardens, make corsets, alter clothing, and write a fashion article for a magazine. 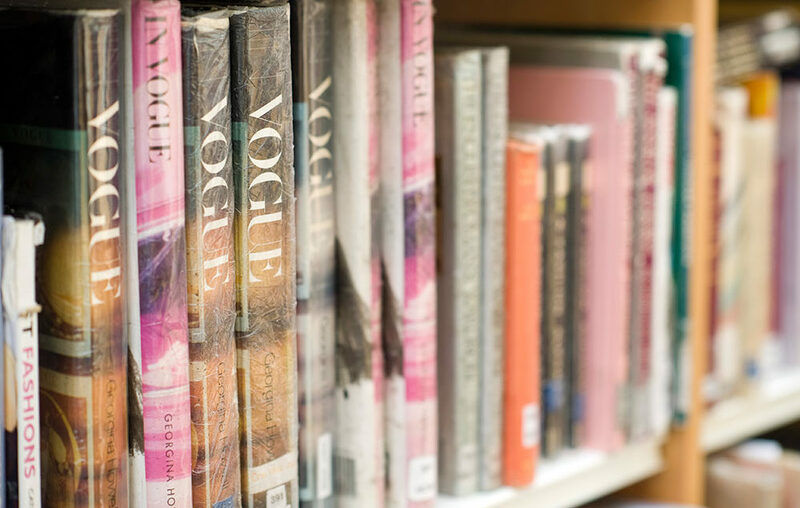 Recently, I realised that all my short courses in the last few years have been fashion related and so I started to investigate options for Masters level study. Most courses were extremely vocational though and so didn’t really hold my interest past seeing how much the fees were. After all… did I really want to be a fashion photographer? Or a fashion journalist? I’m looking forward to finding out more about the fashion industry and the modern fashion system. I can’t wait to explore how we use fashion to shape our identity, express (or not) our gender, and how we fit into subcultures by way of our dress. I’ll be able to research along paths I have already scratched the surface of – lingerie, feminism etc – and will discover many more angles which interest me. I start the course part-time in October. Will this mean I’ll have no time for blogging due to all the reading and essay writing? Well, I guess you’ll have to stick around to find out. The main image on this post is via the LCF Blog. 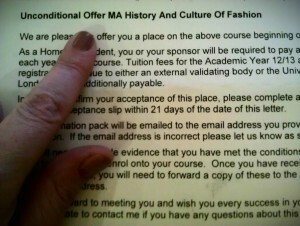 The second image is of my offer letter. UPDATE: I’ve now graduated (passed with Distinction!) and the course has changed for 2015/16 to become MA Fashion Cultures, with a pathway in history and a pathway in film. Sadly, the University of Manchester no longer runs the design course I studied, but they still have a number of textiles courses in their School of Materials. Learning for the pleasure of learning and understanding. Now that's something with which I can identify. And it's an amazing thing to grab hold of. Enjoy! I'm so excited to hear more about your course as you progress! I hope you'll share some of your recommended reading with us!! I too have been on the hunter for the right postgraduate course but the timing isn't right for me. Until then, I love to learn and am makings way through short courses myself!! Yes, I do just love learning! Fashion has always interested me too. My favourite toys as a kid were my Sindy dolls (and the big red Range Rover I had for them!). I will definitely be sharing my 'adventures in learning' here. Perhaps I need to start a new blog series for this?